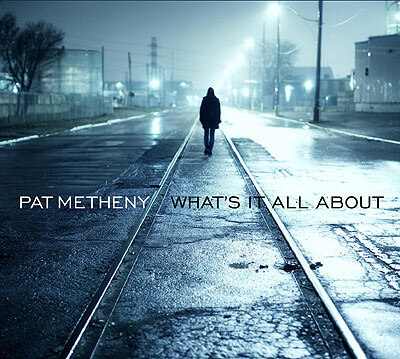 Today’s Cool Album of the Day (#409 in the Series) Is Pat Metheny, What’s It All About. What a surprise it was this week when this little nugget showed up. I didn’t know it was coming but I must say that I’m awfully glad it’s here. It’s always a good day when Pat Metheny released new material. Those days now number in the 40s. (How time flies) This one however is a little different. This album, What’s It All About is an album of cover tunes. Yeah, I know that’s become something quite popular, but not by a jazz guitarist doing songs from the late 60s and early 70s. Besides Pat’s wonderful playing, there’s a few things that I really like about this project. The first thing that stood out was the song selection. I heard an interview with Pat that said that these were some of his favorite songs as a youth. Nearly all, if not all, of them were written before he could play a note, but all of them had something interesting in the structure and melody that stood out for him and made them memorable. They weren’t just your “normal” songs he said. Some of them were hits, some not, some big-time. He opens with one of the most interesting versions of Paul Simon’s “The Sound of Silence” that you’ll ever hear. It’s played on one of the most unique guitars you’ll ever hear as well. He plays it on a 42 string guitar. No, I didn’t accidently type a 4 instead of a 1. He actually has a 42 string guitar. You can see it in the picture and the videos below. 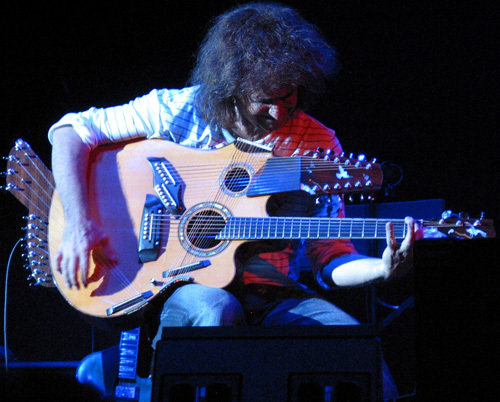 On most songs he plays a baritone acoustic guitar, one with special tuning and strings. Its sound adds to the intrigue. It can be heard on the second track, The Association’s “Cherish.” If you were around back in the 60s you know how big a hit this was. He also takes on “The Girl From Ipanema” calling it one of the first songs he ever learned to play. Carpenters or Carly Simon anyone? You get some here with “Rainy Days and Mondays” and “That’s the Way I Always Heard it Should Be.” What interesting choices once again. Yes, the title track well, I guess you could say the unofficial title track is indeed “(What’s It All About) Alfie.” Pat does a great job interpreting the Dionne Warwick 1966 classic that was written by of course, Burt Bacharach and Hal David. This is one of my favorites on the disc along with the biggest surprise on the album, that would be The Stylistics “Betch By Golly, Wow.” Yeah, Wow indeed! Finally, Pat saves us a real classic to end the album. That would be Lennon and McCartney’s “And I Love Her.” Nothing more needs to be said about that song. I mentioned near the top that there were two things that I liked about this album. The other aspect that I haven’t mentioned yet is the arrangements. He doesn’t just play instrument versions of the song note for note. No not at all, Pat stretches them out and adds his signature to them. “I like the way you made it your own, Dawg,” I guess you could say. He wanders a bit but just the right amount. You know what song you’re listening to; it’s just not overly obvious at times. 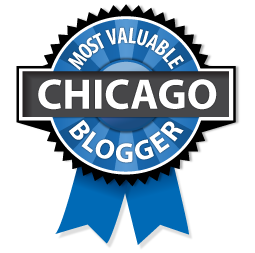 See more instrumental albums that we’ve featured. Many of my favorites can be found on the playlist below. There’s also a nice interview with Pat Metheny as well.